USDA-NRCS PLANTS Database / Britton, N.L., and A. Brown. 1913. An illustrated flora of the northern United States, Canada and the British Possessions. 3 vols. Charles Scribner’s Sons, New York. Vol. 2. (Accessed 6/2014). 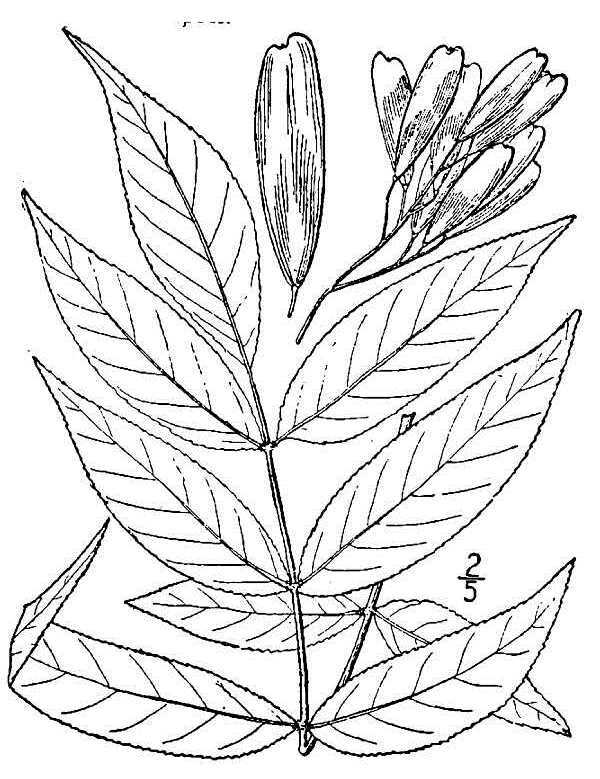 Fraxinus nigra is a tree to 25 m tall; fast growing; shallow rooted; bark furrowed & ridged somewhat scaly. Leaves opposite, pinnately compound, leaflets ca 9, sessile, toothed, buds blackish. Flowers dioecious, small, wind pollinated, May-June. Fruit winged, flat, about 3 cm long, 0.8cm wide, blunt at both ends, winged to base, June-Sept., wind dispersed July-Oct. Seeds must overwinter at least once before germinating. Seeds eaten by birds and small mammals. Habitat: Swamp forests. Tolerant of flooding, drought, soil compaction. Soil pH 4.4-8.2. Moderately tolerant of salt. Intolerant of shade, index 2-4. Notes: Subject to a number of fungal diseases (Burns & Honkala 1990; Hightshoe 1988; Sinclair et al. 1987). A host tree of the Asian longhorn beetle, Anoplophora glabripennis (see Norway maple).